Excavation work conducted at the ancient theatre of Nikopolis. Part of the paved floor of the orchestra on which Nero once stood as an… actor has recently come to light by archaeologists at the Roman theatre of Nikopolis (Epirus). Nikopolis (the city of victory) was founded in 31 BC by Octavian in memory of his victory over Antony and Cleopatra at Actium. In further celebration of his victory, he instituted the Actian games, in honor of Apollo Aktios, to be held every five years. Emperor Nero visited Nikopolis in 66 AD. His visit was part of his tour of Greece. During his stay, he took part in the Actian games, namely in music and drama competitions. Coins were issued bearing the Emperor’s portrait as a sign of respect, while the city’s name changed to “Neronikopolis”. “The unearthing of a part of the orchestra’s paved floor, where actors performed during the Actian games, raises hope for even bigger surprises to come,” as the president of the Scientific Committee of Ancient Nikopolis Konstantinos Zachos said to the newspaper “Ethnos”. According to Mr. Zachos, the pit revealed 5 sq. m. of the paved floor. Since the surveys at Nikopoli’s archaeological site will be funded by the NSRF program (approx. 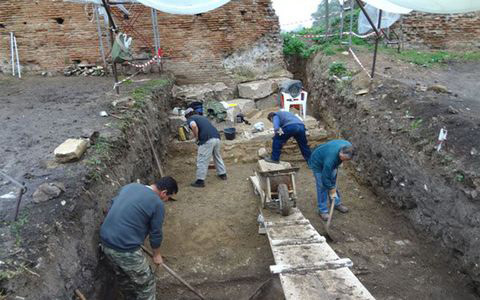 2,5 million euros) it is expected that the excavations will bring to light a significant part of the floor, if not the whole of it. Archaeologists believe they will be able to reconstruct in full the initial form of the theatre, while visitors will be able to fully comprehend the monument as it was in antiquity. The Nikopolis theatre is the most spectacular building of the site, which comprises the Odeion, the Roman fortification, the Stadion and the Agora.